Tuft & Needle's simple but customer-friendly approach has resulted in a well-received, sturdy, reliable and overall above average mattress for a very much affordable price. In 2012, Arizona-based Tuft & Needle was founded by college friends and fellow software engineers Daehee Park and JT Marino. The story: JT had just gotten married, and as the newlyweds searched for a new mattress—the very first piece of furniture they would buy together—they discovered that the process was quite unpleasant. Showrooms were filled with products that had insufficient return policies, and commission-hungry salesmen kept on trying to get them to buy mattresses that were feature-laden and very expensive. JT told co-worker Daehee of the ordeal the next day—who, in turn, admitted that he had experienced something similar—and that was the start of what would eventually become the mattress company Tuft & Needle. What sets apart Tuft & Needle from the rest is the simplicity of their approach: no gimmicks, no pushy salesmen, no jacked-up prices, no payment plans. Just a focus on customer experience; and products that are the best they can be, with price points at which they should be sold and some of the friendliest warranties and return policies around. 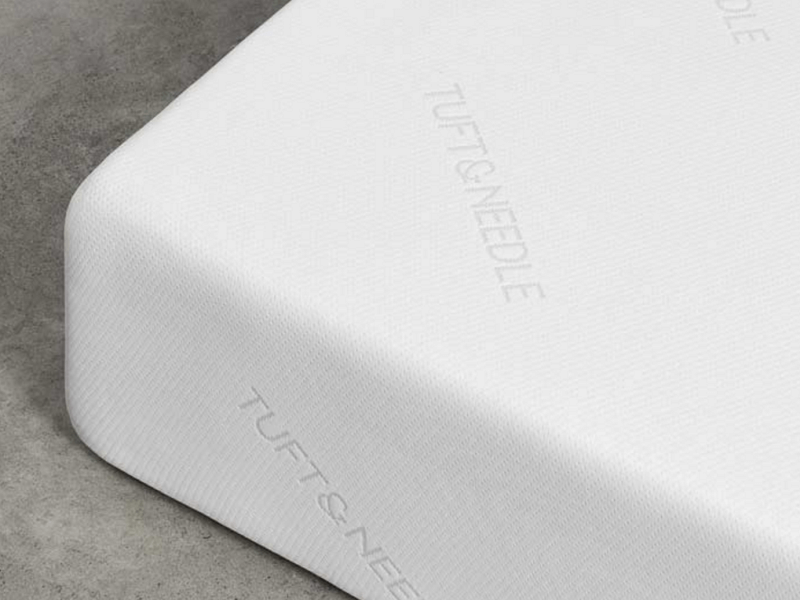 Tuft & Needle has developed both a mattress and a compatible pillow; but of course, for the purposes of this review, we’ll focus on their flagship 10-inch mattress. Its design is one of the most straightforward among the current crop of new mattresses that are part of the booming and revitalized industry marked by e-commerce, doorstep delivery, and easy returns. The two layers of foam used for Tuft & Needle mattresses are both CertiPUR-US and UL Greenguard Gold certified. The fire sock and mattress cover that encase the foam layers are similarly distinguished; they’re made of textiles that hold STANDARD 100 certifications given by by OEKO-TEX. The three-inch top layer is made of a proprietary adaptive polyfoam that is unique to Tuft & Needle products. As the part of the mattress that interacts with and is felt most by sleepers, it is a designed with three things in mind: comfort, cooling and support. With a density of about 2.9 PCF (pounds per cubic foot), the foam provides pressure relief and a universally comfortable and responsive feel. This top layer is also infused with a cooling gel, as well as graphite, to reduce heat transfer and help you sleep cool throughout the night. The seven-inch foundational bottom layer is made of high density base support polyfoam. With 1.8 PCF, it increases the durability of the product and is also critical to providing and maintaining its shape and dimensions. Providing additional support for mattress sleepers is essential, and this thick base is designed to keep your neck and spine properly aligned. That’s it! Tuft & Needle focused on creating the best proprietary materials, rather than a complicating the process unusual specifications or multiple layers of foam within. It is their belief that more layers and more design customizations just mean more glue and more varied elements used, and therefore a greater tendency to miss small details, as well as reduce airflow and encourage heat transfer and retention. This same idea of excellence and simplicity is applied to their fire sock and mattress covers, too. The fire sock—as well as the foam layers and the mattress cover—don’t rely on or contain flame retardant chemicals. Instead, the tubular flame barrier that fully encases the foam is made from a knitted fabric that is basically a blend of four inert fibers that are inherently flame retardant and fully meet US law-supported burn test requirements. On top of this fire sock is the Tuft & Needle mattress cover, made of a textile blend containing polyester and a synthetic fabric called Tactel. The latter is commonly used in clothing as a cotton alternative, as it dries much faster and is therefore more cooling. The resulting blend is designed to last; it is pilling and tearing resistant, though not truly machine washable. In fact, Tuft & Needle does not recommend removing the mattress cover at all. Because Tuft & Needle keeps it simple, you won’t find any special features. Instead, what’s offered is a well-functioning product for a decent price. There are no side handles for easy mattress transfer or repositioning, for example. There’s no extra padding or quilting on the mattress cover for added coziness or softness, no piping on the sides for added edge support, and not even stitched or sewn in patterns for aesthetic reasons—apart from the very utilitarian repeating logo for brand recall. 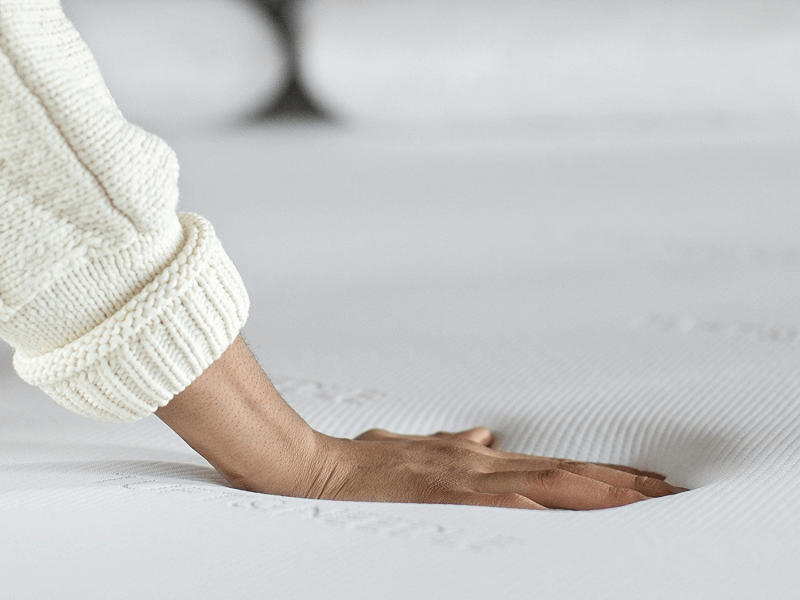 We’ve already mentioned that Tuft & Needle does not recommend removing the mattress cover for any reason at all; while the cover comes with a zipper, it is not intended to be washed, and cleaning should only be confined to small spot treatments. Note that if you’re anticipating stains or spills, it’s best to use a third party mattress protector between the mattress and your bedsheets. Tuft & Needle recommends using a breathable but moisture-resistant protector in fitted sheet form. The Tuft & Needle mattress is available in six standard US mattress sizes: twin, twin XL, full, queen, king and California king. As stated above, every mattress is 10 inches thick; a standard height that it shares with many market counterparts. The weight is also comparable to other mattresses available online; even taking packaging and insulation into consideration. The Tuft & Needle mattress shipping weights range from the twin’s 50 pounds to the California king’s 94 pounds. Shipping is free in the contiguous US, and you can get it delivered straight to your doorstep; although Tuft & Needle currently only offers its products and services to the US and most parts of Canada, so if you’re based elsewhere, you will have to look for alternatives. What Can Be Used with It? One of the best things about the Tuft & Needle mattress is that it is specifically designed for use with a great number of bed bases, box springs, frames, foundations and platforms. It is even flexible enough to work with adjustable bed bases and frames without risk of long term mattress damage or warranty voiding. It’s not a mattress that requires a box spring, either; though it’s perfectly fine to lay it on top of an existing box spring, if that’s what you have available and you prefer the height it gives the bed. Just make sure that the box spring is in good shape. Slatted frames need to be a certain kind—with slats no more than four inches apart—but other than that, the main qualification is solid and even support all throughout the length of the underside of the mattress. Even bunkie boards or the floor will do. After placing your order online or at one of Tuft & Needle’s physical showrooms—which don’t carry inventory, so you can’t walk in to buy a mattress and walk out with a product in hand—you can expect your mattress to arrive in about two to four business days; unless you are in Alaska, Hawaii, or Canada. Shipping to these areas can take up to 10 business days; even 12 days for more remote areas. Note that Tuft & Needle services most of Canada, but doesn’t ship to Quebec. Shipping is taken care of by FedEx Ground, which delivers all weekdays except for holidays. You don’t need to sign for your new mattress when it arrives, unless you have it shipped to a place of business. However, leaving your package right at your front door when you aren’t home is at each FedEx Ground driver’s discretion; they may choose to safely re-deliver it on the next available business day instead. You can also request to have a signature required for home delivery. 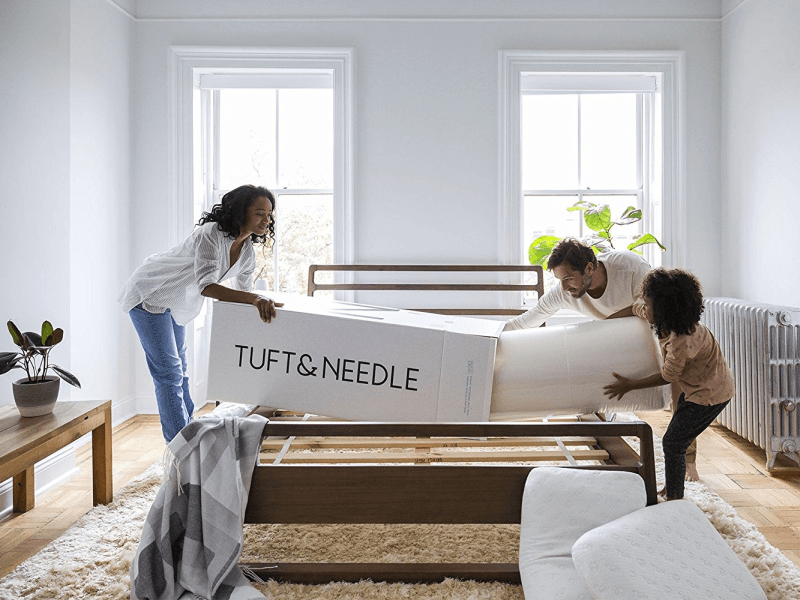 Tuft & Needle suggests unboxing your new mattress within one month of delivery. To do this, simply take the plastic-encased and rolled up mattress out of the cardboard box it was shipped in; and position it on top of your bed base, frame or wherever you intend to place it. Find the ends of the plastic wrapping material; they should be stuck to the side of the rolled product. Pull on these ends until the mattress completely unrolls and flattens out. Remove the plastic completely; your mattress will start to take shape and expand at this point. The company recommends leaving the new mattress alone for about three hours so it fully decompresses. It should be ready for use after that, but if you notice any off-gassing—that “new mattress smell” that some find unpleasant and irritating—you may want to transfer it to an empty room to air it out for a few more hours or days until the odor is no longer noticeable. The Tuft & Needle mattress has a weight capacity of 500 pounds per expected sleeper; a total of 1000 pounds in mattresses for two. The latter includes the full, queen, king and California king sizes—although the company does state the a full-sized mattress may be too cramped for two people to share. Do also note that while the king and California king sizes are very spacious and can accommodate additions like pets or children, the weight capacity remains maxed out at 1000 pounds because they are still considered two-sleeper mattresses. Like many new and contemporary designs, the Tuft & Needle mattress is supposed to be universally appealing in terms of both comfort and firmness. It is meant to be both soft and supportive, relieving pressure without allowing for too much sinkage and cloying contour. One of its main focuses is breathability and proper airflow; you won’t sleep hot on a Tuft & Needle mattress. However, if the cooling nature of the mattress leaves you needing extra warmth on cold fall or winter nights, you can go ahead and use a third party heating pad—the mattress won’t suffer from any long term damage because of it. Do also remember that the Tuft & Needle is designed to have a top and bottom side; unlike old mattresses, you should not flip it, and rotating it may not make much of a difference. Keep the zippered side down and you will experience maximum comfort. Tuft & Needle has compiled over 50,000 reviews of its mattress from several sources—Google, Amazon and its own online store—and the company proudly notes that the product is rated an average of 4.7 out of five stars. Customer service, which we will discuss in more detail later on, seems to play a large part in this very positive reputation. Transactions, including both purchases and returns, are typically described as both professional and painless. Complaints were mostly of what we like to call the “Goldilocks” variety; unsatisfied customers insisting that the bed is either too soft or too hard. The proper firmness is a subjective, after all. However, we noticed a repeating issue that seems to be separate from this. Several people complained about a lack of edge support, citing difficulties like too much sinkage while sitting at the edge of the bed to put on shoes or do other normal activities. There are also some repeat customers that have noted big firmness differences between old models and new ones bought years after—though that is purely anecdotal and may very well be unfair, as there is no official comparison to back the claim up. Tuft & Needle is just a little bit older than some of the most popular mattress-in-a-box companies today, like Casper and Leesa. Not much of a head start, to be honest; but the company does have a slight edge when it comes to the number of physical showrooms that is has. Store locations include Phoenix and Scottsdale in Arizona, and San Francisco in California—with more one the way. However, it’s important to note that you can try out the mattress and the pillow products there, but you won’t be able to walk out of the store with a product in hand, as they don’t have stock or inventory. What you can do is place an order right then and there; and also get an advanced physical feel of the mattress, before your trial period even starts upon delivery. Not bad, if you happen to be near one of the locations. How Easy Are Returns? How Good Is the Warranty? 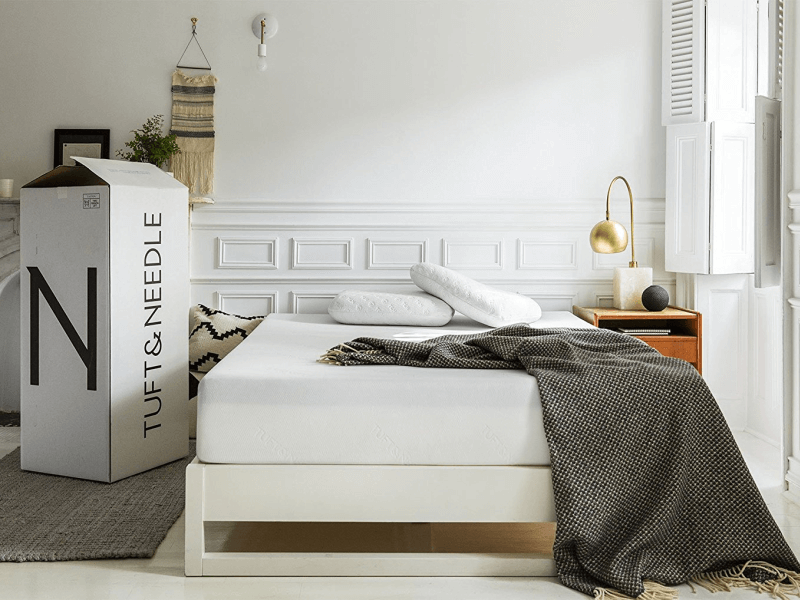 Tuft & Needle offers a standard 10-year mattress warranty, which covers products purchased either through the company’s online store or Amazon. The warranty covers manufacturing defects, of course—sagging, body impressions on the foam that don’t spring back, unraveling stitching on the cover, or cracks and splits in the foam material itself—but not regular wear and tear from rest and sleeping, and certainly not damage arising from special circumstances. There is also a standard 100-night sleep trial, which allows you to test your new mattress with over three months of daily use. This should be enough time for you to ascertain whether or not the product is defective, whether or not you find the firmness to your liking, whether it works well with your existing bed furniture, and whether or not you sleep soundly on it. This trial and possible subsequent product returns is likely the real reason that Tuft & Needle’s services and shipping extends to only most of North America. It would be very difficult to uphold a trial period and its accompanying return policy if transactions could be made internationally. 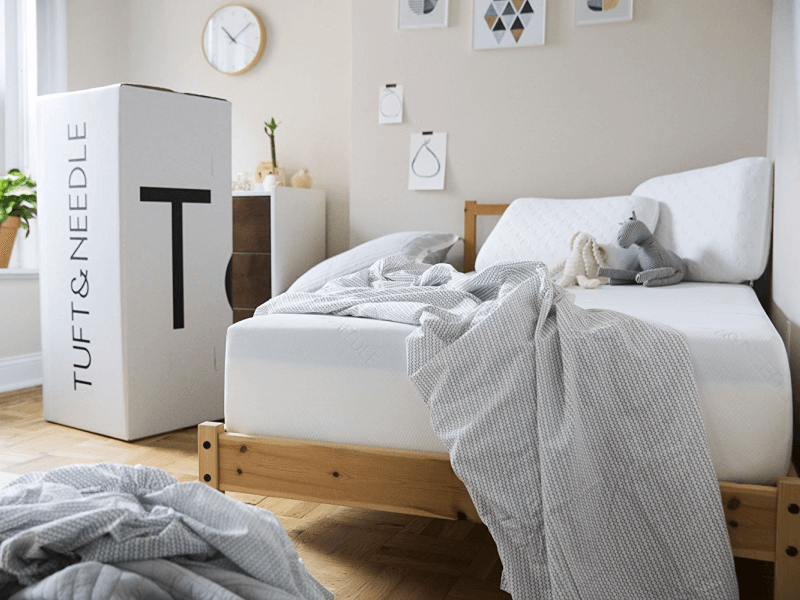 As an aside, Tuft & Needle claims that 95% of their customers end up keeping their mattresses and not availing of the trial’s attached return policy. Returns are very easy to arrange, though it must be noted that extra shipping costs—if you had the mattress delivered outside the contiguous US—will not be refunded. The full refund simply refers to the cost of the mattress. Customer service is efficient, friendly and hassle-free. There is an email address and a telephone number you can use to contact the company, and even live chat on the official website. For any other concerns there is a comprehensive FAQ section, too; and you can even check out their very active social media accounts. As of this writing, the queen-sized Tuft & Needle mattress is available for $575, plus a shipping fee if you live in Alaska, Hawaii or Canada. You can pay via American Express, Discover, MasterCard, or Visa; and can even buy it on Amazon instead of the official website, if you are so inclined. It is very affordable, with a price range that’s quite cheap compared to its mattress-in-a-box competitors; though it should be noted that proprietary material aside, you are basically paying for a polyfoam mattress shipped to you in a box. Many current counterparts on the market are a little bit more expensive because they use memory foam, or have more features added to their mattress covers and product design. A Tuft & Needle mattress is not so much a steal as it is a more stripped-down, prudent option. If you’re not fond of complicated customizations, unproved leaps in technology, and frills or added features, a Tuft & Needle mattress may very well be right up your alley. It’s also a great choice for heavier sleepers, due to its above average weight capacity. Simple and straight to the point, this product really makes only one promise: excellent customer experience. This is something that the company fulfills whether or not you decide to keep your new mattress; its real strength lies not in the product design—though the mattress is straightforward and streamlines as they come—but in the transparency and honesty weaved into both the 10-year warranty and the 100-night sleep trial, as well as the full-refund return policy. Sure, shipping costs aren’t refunded; but if you happen to reside in the contiguous US, where shipping is free, trying out a Tuft & Needle mattress and returning it should you not be satisfied is painless and comes at zero cost.